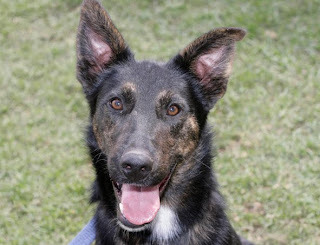 For well over half his life, Kelpie cross Ziggy has lived at the RSPCA Sydney shelter. Surrendered in December last year as a five-month old, Ziggy recently celebrated his first birthday. But his ultimate birthday wish would be for a new family and a loving home. "A gentle natured boy, Ziggy hasn't seen much of the outside world so a staff member is currently fostering him. This will help to ensure he's happy, socialised and well adjusted to life outside the shelter," said Adam Farrugia, RSPCA Sydney Shelter Supervisor. A sweet, affectionate and well-mannered boy, Ziggy has lots of energy and so requires daily walks and playtime. "As he's still quite young he does like to chew, so will need plenty of toys to play with," stressed Adam. As Ziggy has spent most of his life at the shelter he's looking for a patient family who will introduce him slowly to new people and different environments. "He can sit and has begun toilet training, but for Ziggy to continue being a happy and well-mannered dog, his new owners should continue with his obedience training." An energetic dog, he's best suited to a home with children over 10 years. Do you have room in your heart for Ziggy? $300 to adopt, Ziggy has been behaviourally assessed, desexed, microchipped, vaccinated, wormed and health tested. The RSPCA Sydney Shelter, 201 Rookwood Rd, Yagoona, is open 6 days (closed Wednesdays) for adoptions. For more info, head to www.adoptapet.com.au or call (02) 9770 7555.